I stand in front of the axe blade that in the year 1830 beheaded Agnes Magnúsdóttir, the last person to be executed in Iceland. It was an expensive blade imported from Denmark. It did a good job and the head flew off in one strike. 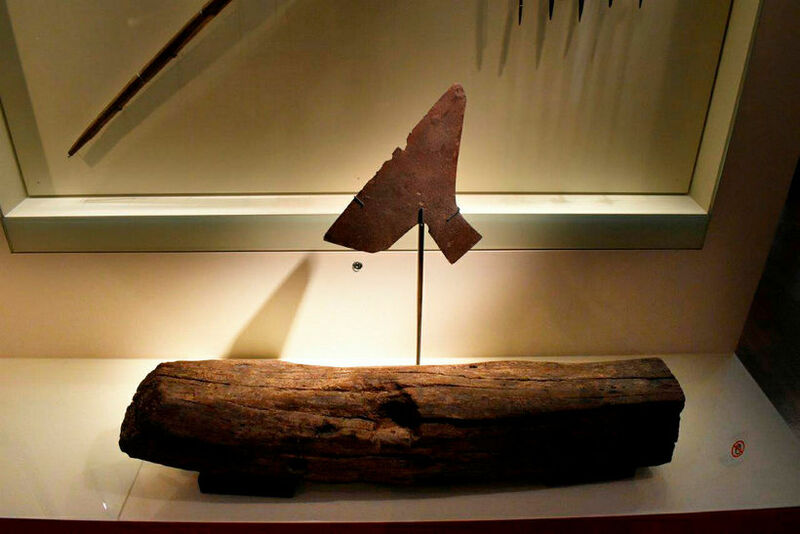 Now it's rusty with a jagged edge and on display at the National Museum of Iceland. Just like the blade, Agnes still exists. She has survived in Icelandic books and movies, it's only now she has gained international fame through the book Burial Rites, that will soon be turned into a film and no less a star than the mighty Jennifer Lawrence will be interpreting this poor Icelandic woman. Agnes' accomplice in the murder of Natan Ketilsson, Friðrik Sigurðsson, was decapitated that same day. Friðrik killed out of love for the maidservant Sigga, that Natan the farm owner and a notorious womanizer, denied him. He slept with her himself, just for fun. Agnes who loved Natan, witnessed this, and if she took part in that crime, as history book say, it must have been a crime of passion – love or hate – possibly a mixture of both. Agnes and Friðrik are said to have brutally killed Natan and burnt down his farm. The fancy axe blade and the block. Even though this criminal case dates from the early 19th century, Icelanders are still intrigued by it. 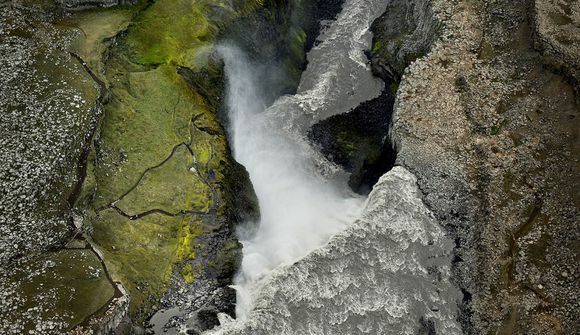 So was Hannah Kent, an Australian exchange student that stayed one year in the town of Sauðárkrókur, not far from where Agnes lived 200 years earlier. 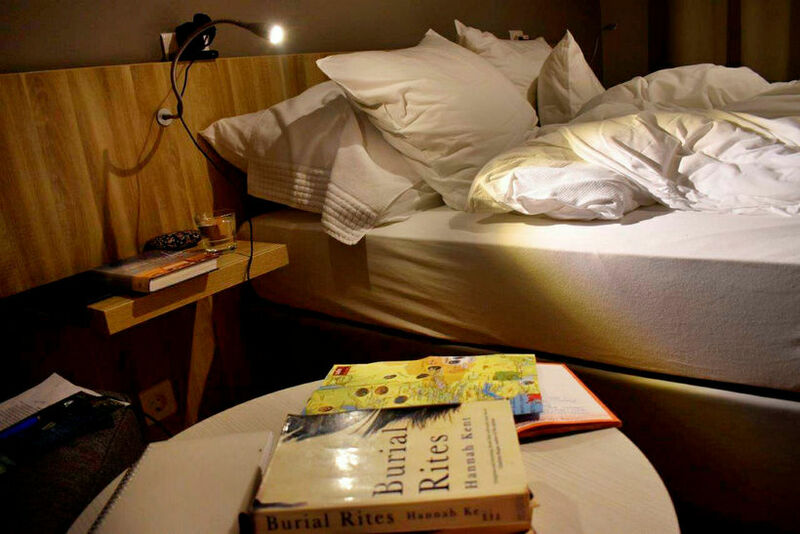 She wrote the bestseller Burial Rites about the last year in Agnes' life. In spite of the book being based on a true story, no one knows what really happened, as the authorities at the time didn't really care to find out. “Their injustice is bad, but their justice is worse,” says in Bell of Iceland, a book about a man unjustly condemned in the 1700s by Nobel Prize author Halldór Laxness. I read Burial Rites and loved it. It sucked me in and now I'm going all the way. I'm going to get closer to Agnes, see her dwelling places. Get a tangible insight into her life. Stand in the midst of the landscape that surrounded her daily, where she roamed from one farm to another, first as an abandoned child, later as a work maid. There is a long road-trip ahead, and I'm ready. Glanni waterfall was on my way. I head for Laugarbakki, in the direction of Agnes’s whereabouts. I drive in and out of Hvalfjörður, The Fjord of Whales, in weird weather; heavy fog and swirling snow on the road. Spooky. While writing the book Kent could feel the presence of Agnes. The actress that played her in the Icelandic movie said much the same. Seems like Agnes wants her story to be told. Was she visiting me now? Trying to influence this little story of mine? In Icelandic folktales you meet the departed ones when alone in the fog. What do you want to show me Agnes? 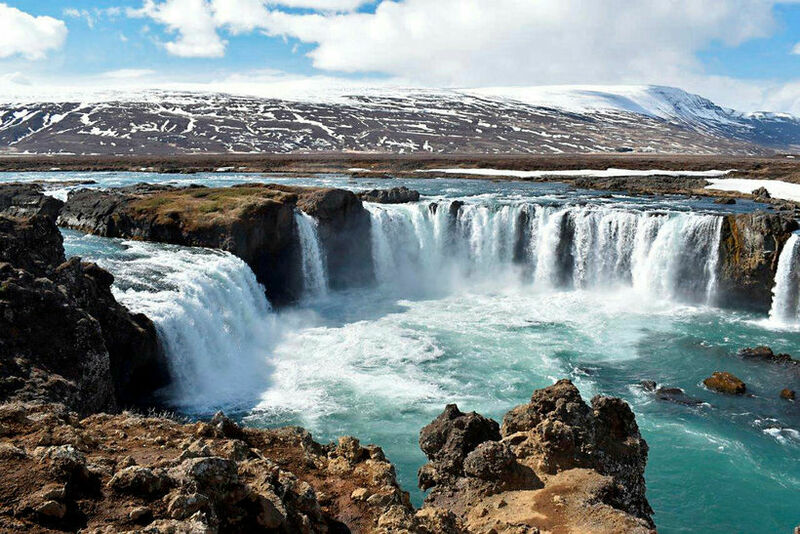 The beautiful waterfall Glanni is next on my way, representing the power of Icelandic nature. The Holtavörðuheiði Heath on the other hand introduces me to all the different kinds of weather possible to encounter in Iceland. I see summer, which reminds me of when Agnes and Natan were first romantically drawn to each other. Winter and snow recall when he threw her out of his house naked to freeze to death. At Reykir Regional Museum I get one big step closer to Agnes. I get to observe the brooches that held together her top on the day of the execution. The day she put her finest clothes on. The nice curator opens the cabinet so I can take better pictures of them. All I want to do is to touch the brooches, touch something that I know Agnes touched, but I don't dare ask. I take a picture of a book someone hand wrote about Natan. 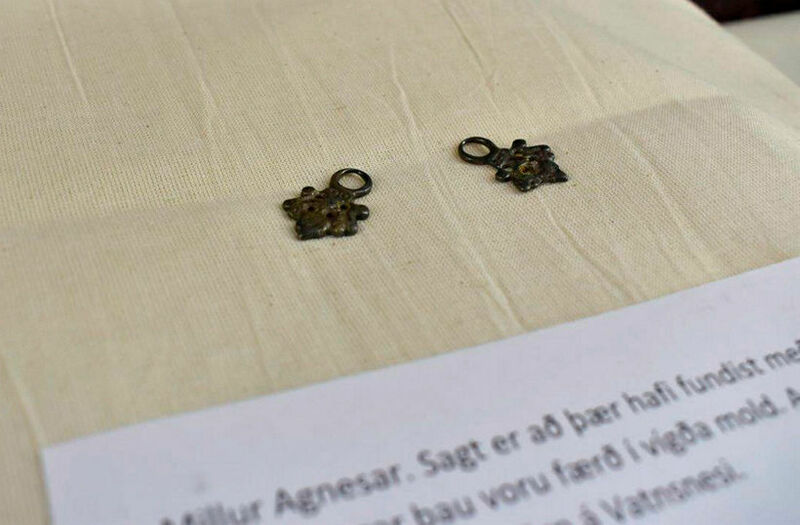 I take a picture of golden buttons that a poor work maid stole for her son from Björn Blöndal, the district commissioner, who had commanded the execution of Agnes and Friðrik, and had the fancy blade made abroad. The nice curator says it really shows the living condition of the poorest at the time. They basically risked their lives to make things better for their kids. Still today people living in that area are not too keen on talking about these events. Some of them are descendants of Natan or his brother Guðmundur who was the executioner. Some had grandmothers that still remembered these events and refused to talk about them. Cozy times and fluffy duvets. Hotel Laugarbakki welcomes me with a wonderful hot shower and the best down duvets on earth. They were actually the reason why people slept naked in the old days. But unlike me today, they might have woken up with their head frozen to the pillow or to the turf wall they slept next to. 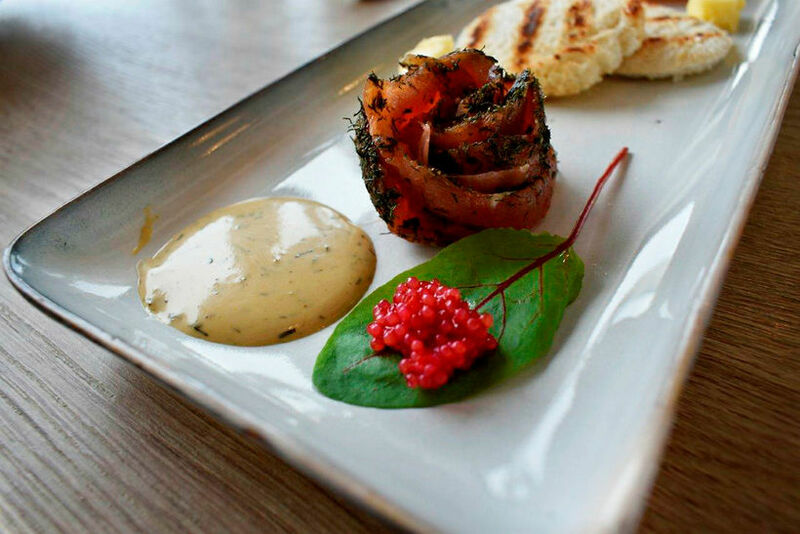 They weren't either going to wake up to a cornucopia of a breakfast; somewhat continental, somewhat Icelandic, and of course containing cod liver oil - skál! Today is the big day. Vatnsnes peninsula awaits me; the home of Agnes which she never left all her life. It's raining. Like in the movies when sad things happen. It's also sunny and windy and snowy and cold. And it's empty,like the tourism in Iceland skipped over this little peninsula. I drive and see no other cars. It's hardly a road; more like a one-way gravel path. I have an infinite view of the sea, the mountains and the clear sky. All have a different shade of blue, very tastefully combined. Even the snow in the mountains has a special blue hue to it. I hope you could admire this every day, Agnes. But when I'm in awe of the landscape and its colors, this was just all you knew, and I guess you had other things to worry about. My biggest concern today is that my mascara is running in the cold wind. Illugastaðir is the farmstead where Natan's farm stood and burned down on the night of the tragedy. When Agnes came here she saw the sea for the first time. I see what she saw and I can understand that she felt happy. The endlessness of the horizon, the feeling of freedom that she thought she was going to attain by living with Natan. Thinking her suffering was over and that she was becoming a respectable housekeeper. Wrong. The ruins of Natan's workshop are still standing and I go inside because I know Agnes went there. Am I standing at the same spot as you did two centuries ago? I drive on those one-way gravel roads. This is as close as you can get to what it must have looked like in the old days. I arrive at the Tjörn church. In the cemetery surrounding it, one has to be careful not to step on graves. 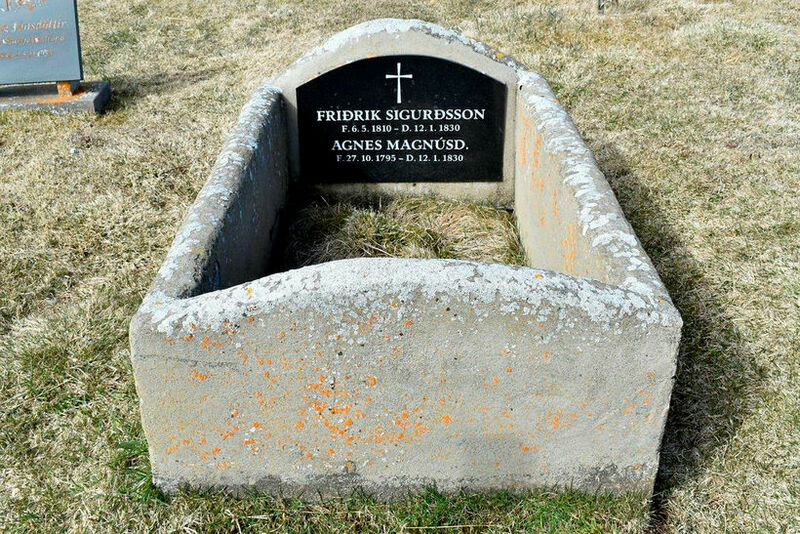 But the grave of Agnes and Friðrik has a little fence built around it. They were walked on enough in life, don’t have to continue that in the afterlife. Here they lie side by side, not friends in life, most likely partners in crime, together forever. It feels wrong. 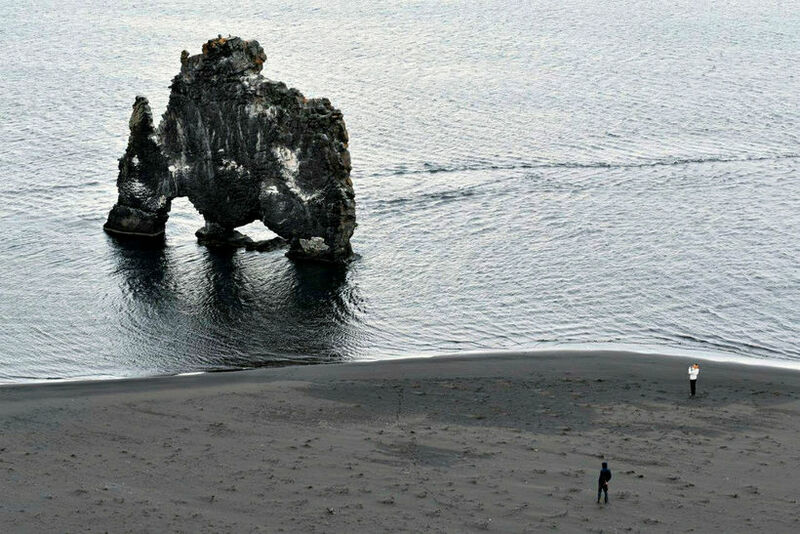 The natural phenomenon Hvítserkur sea stacks, looks like a giant cow drinking from the ocean. Or is it just me being thirsty and not finding a shop anywhere? But what I find is the first human beings of the day; tourists, tourists. I pass the farm Stóra-Borg where Agnes was first held after the tragedy, and where she was badly abused. Up and down impressively squirmy, muddy and bumpy gravel roads. I climb up to the Viking-era fortress and hide for a while. From what? Nobody? The weather possibly. I take a look at the farm Vatnsendi, where the Poet Rósa lived. In spite of being married, she was in love with Natan and had his child. She didn’t like Agnes a bit. Rósa wrote poetry about how she stole him from her. And Agnes answered with a verse. Poetic rivalry. Rósa visited her lover at Illugastaðir. That's a long, long walk or ride in unpleasantly unreliable weather. What didn't people do for love in those days? Apart from killing? Half of my double salmon. Back at lovely Hotel Laugarbakki I have a date with double salmon and a glass of Sauvignon Blanc in eerie light. It's late at night and it seems seems like high noon. Yes, the nights are bright in Iceland in the summer, but this spectral light is caused by the really strong sun being covered by mist and reflecting in the snow. I have never seen anything like it. Unearthly. Agnes worked in a kitchen like this. 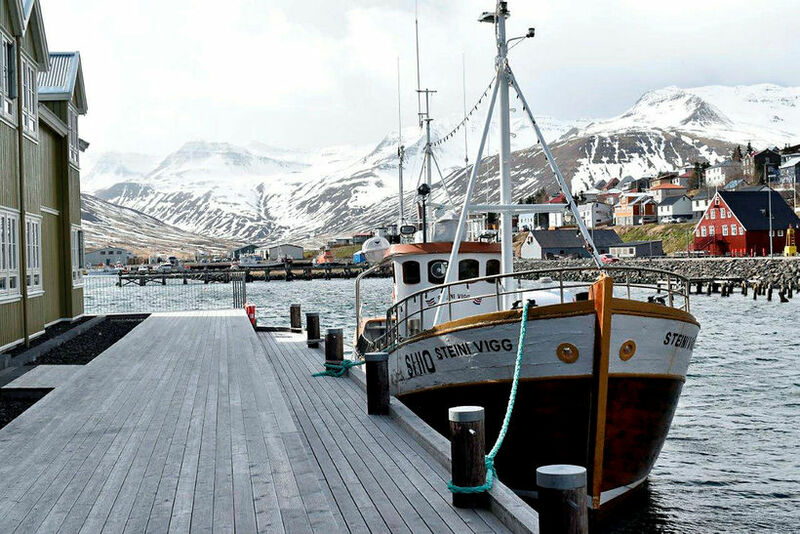 I head for the town Siglufjörður situated on another peninsula, but I'm not leaving Agnes right away. My next stop is Þrístapar, the site where the execution took place. It's in an area where little hills have assembled for some geological reason. Three of them stand side by side and they saw Agnes on her last day. I walk toward the hills, watching out to not step in the mud or a pool of water. Weirdly, my heart beats faster when nearing that place. I just remember so clearly the final chapter in the book when Agnes was on her way to be killed. So disturbing. I can't go all the way and turn back to my car, away from that uncanny feeling. Kent, the author of Burial Rites, recommends in The Guardian going to Glaumbær Heritage Museum if in the north of Iceland, and as soon as I get there I can understand why. Glaumbær is an old turf farm, and you can just imagine the life of Agnes and people from that time. This farm is way fancier than what Agnes was used to. 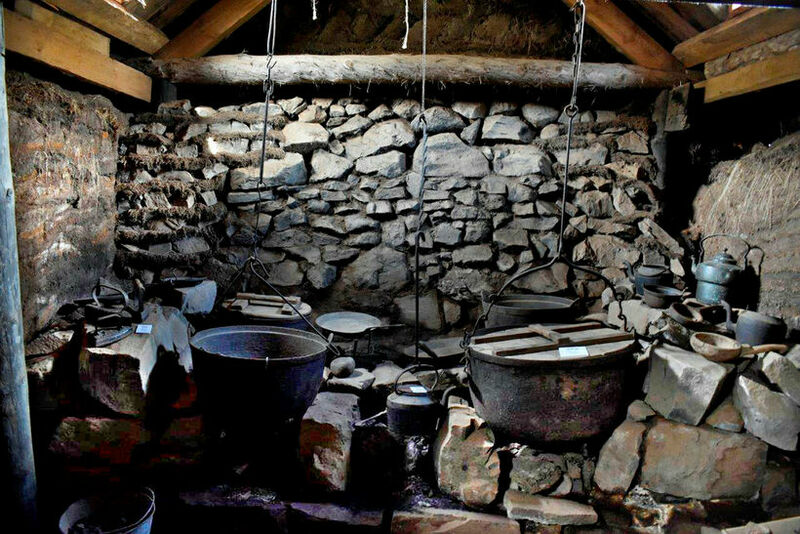 The kitchen dates from her time, and it's awfully cold, wind blowing through the windows, even though they have glass in them now, that they did not have at the time, but a sheep stomach lining. They tell me that Kent would come here while researching the book and sit for hours, just to feel the cold and image living here and working. Trying to understand what and how Agnes felt, inside out. 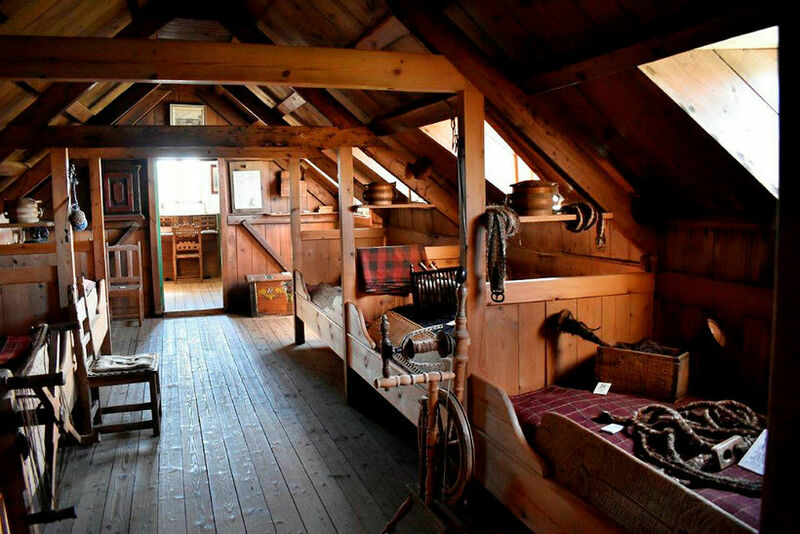 I go up to the “baðstofa”, the sleeping loft, where everybody slept naked, two in each bed. For this to work out there was sleeping loft etiquette. Natan did not respect it – and we know what happened to him. Continuing my trip to Siglufjörður, I go through Sauðárkrókur where Kent lived and became inspired by Agnes's story. A cute little town where I gobble up a lobster and shrimp sandwich at a local restaurant Kaffi Krókur, and then drive up a hill to the cemetery, from where is the best view over the town according to Kent. 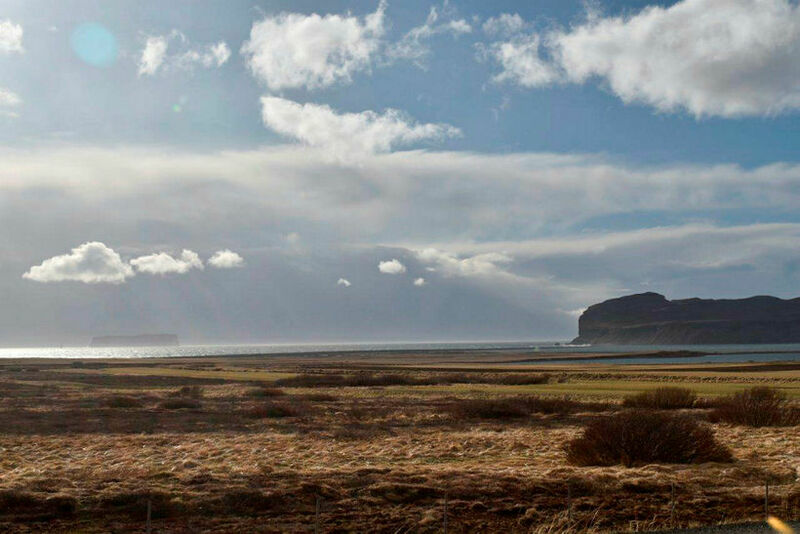 You can revere the fjord with its islands famous from the Sagas and the town's pride mountain Tindastóll. 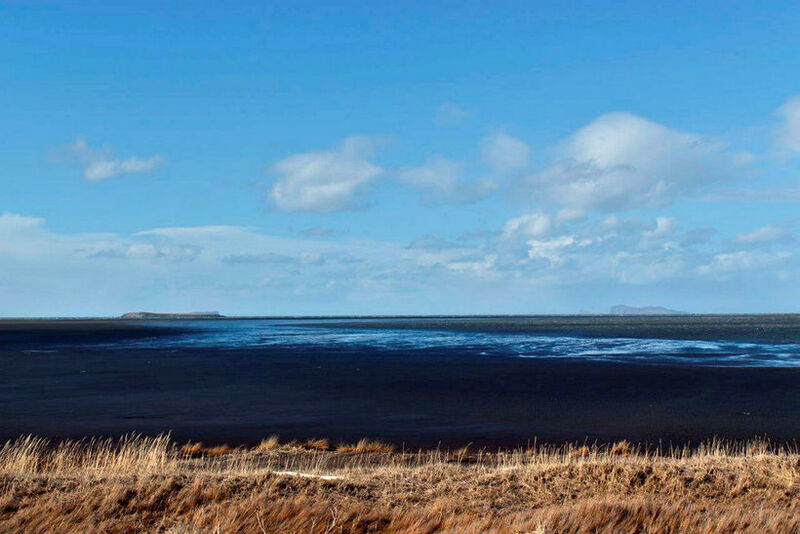 When leaving town I go over Héraðsvötn River; mind-blowing beauty of black sand dunes, with sandy colored straws, purple mountains against the blue sky, and I can certainly understand this is still Kent's favorite place in Iceland. Costumes far right and left date from Agnes' time. 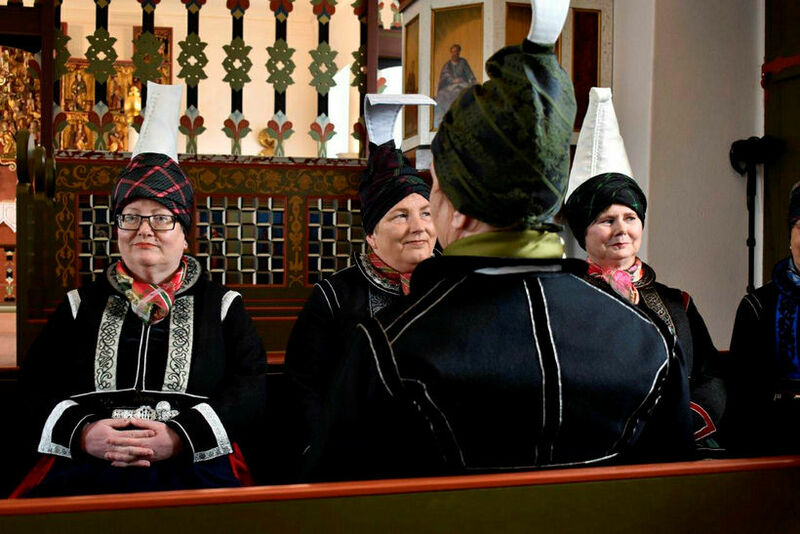 The historian in me flips out visiting significant bishopric at Hólar, where the bishop is a smiley lady in sneakers, and a group of cheerful ladies show off their national costumes. The very cute wooden church dates from 1763 and is full of exquisite church artifacts. The most precious ones in Iceland! The sportswoman and the landscape lover in me is physically and mentally satisfied swimming in the infinity pool at Hofsós. 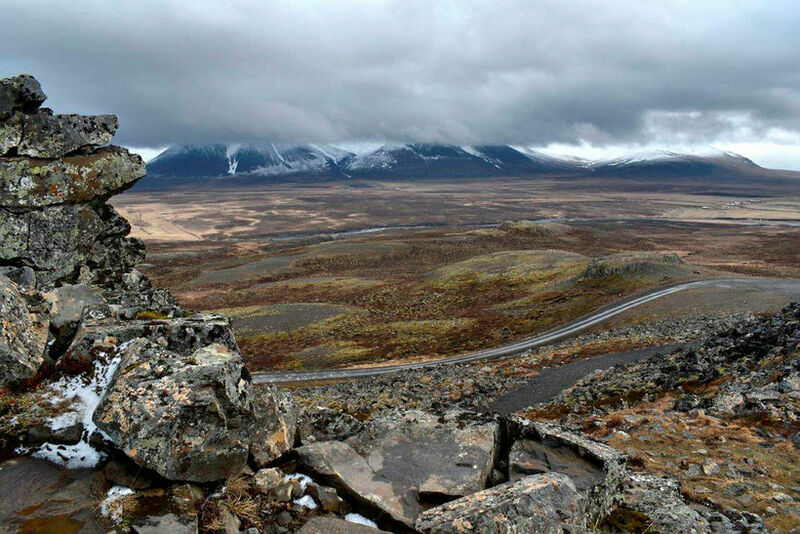 I enjoy the exhilarating view while I'm there, because the adventurous explorer within me is driving around Tröllaskagi or Troll Peninsula, where I better keep my eyes on the road that's honestly hanging on the steep mountain side. My eyes can't help but looking for troll formations in the mountain that covers the peninsula, and they are also constantly drawn towards the horizon on the other side. There is nothing there! Just the North Atlantic Ocean as far as you can see or is it Greenland Sea? Sigló Hotel in the morning. Through a tunnel I go and I'm astounded by the charming town of Siglufjörður situated in the narrow fjord by the same name. It used to be a herring town in the mid 20th century, but the herring left and instead came this quite astonishing Herring Era Museum. On a good day they put on a little play, about the herring workers, their hard life during the day and dancing at night on the docks. Fun, fun! And Sigló Hótel is one of a kind; so tastefully chic that I take an extra breath of thrill entering it. Breathtaking view from all sides, as the hotel is built out into the harbor. I could just sit on my windowsill, look at the waves and the mountains and meditate, but outside there are very tempting hot pots and a sauna built into the marina, so I throw on my soft bathrobe and slippers and get my weathered and tired behind in there. 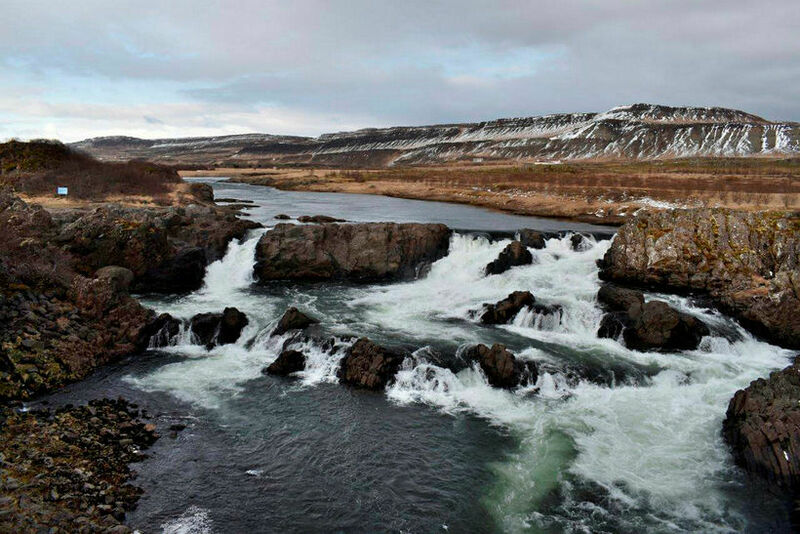 Goðafoss is close to the Mývatn area. No more relaxing and on with the road-trip! Akureyri, another city in a beautiful fjord, is the next point of destination, and on my way there I get to Goðafoss waterfall. Tourists, tourists. I need to squeeze myself in between them to get to take a picture. 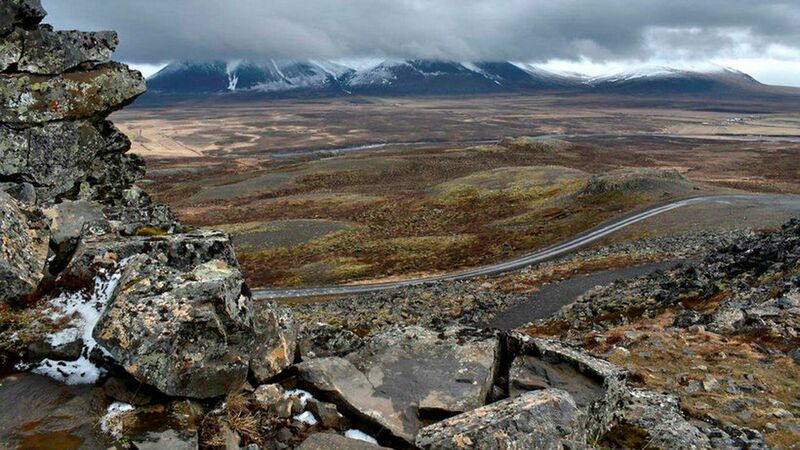 Then I thread through the most various geological wonders of Lake Mývatn area. First, the somehow friendly pseudo craters at Skútustaðir, then through lava fields to visit Dimmuborgir. 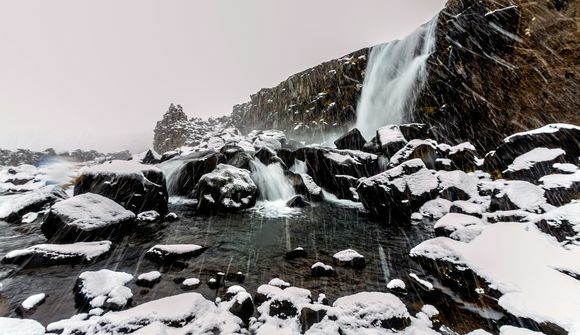 The name means dark cities or darks forts, and it is told to be the home to trolls, even the famous Icelandic Yule lads. When I look closely enough I can clearly see them, so it's obviously all true. I'm very pleased to have entire stoned families welcome me after not being able to look for them at Troll Peninsula. Námaskarð with it's stinky pools. Hverfjall is a huge pile of gravel, a big old crater, and looks like an hours walk to get up, but in fact it's only around 20 minutes walk and quite an enjoyable one. 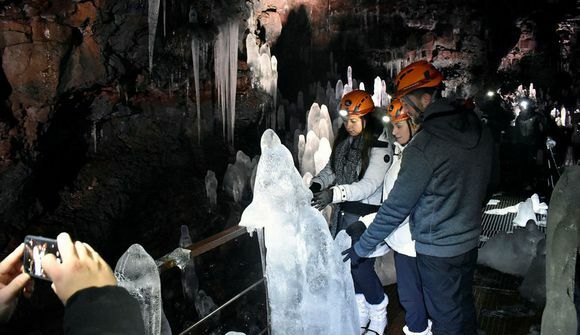 You can also take a look at a crack in the ground, called Grjótagjá, where Icelanders used to bathe before the water in there became too hot after an eruption, or dip into the Mývatn Nature Baths, which is truly heavenly. 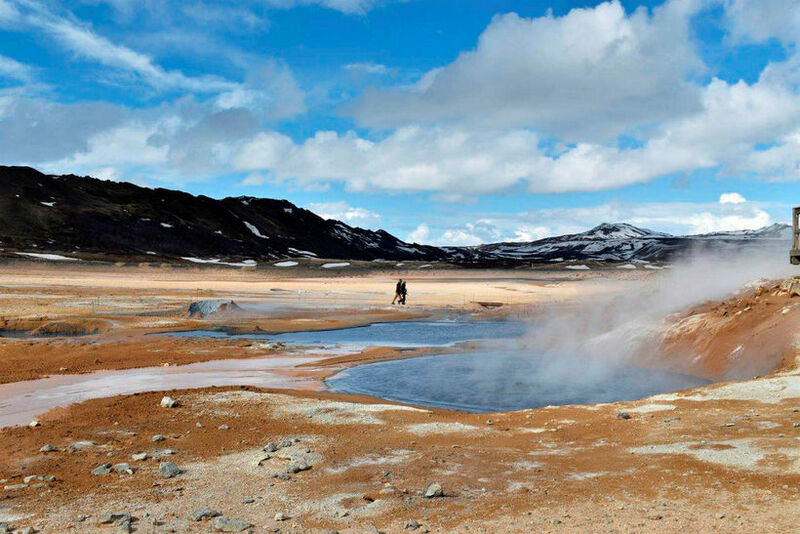 I recommend you go first and look at the Hverir at Námaskarð; sulfurous mud springs and steam springs. The colors of the mountain and the mud are quite distinctive, I can't imagine who came up with them. I and a gentleman, both photographing the mud pools, look at each other, nod smilingly, agreeing this sure is something else. So is the strength of the sulfurous smell. You feel it penetrate your clothes and … Yes, it's a good idea to go to the Nature baths when you are done observing the pretty stinky mud pools. I like it black and blue. I ask myself if God was in the blue period of his creative career, when he created Iceland. I would like to praise him/her for an interestingly large and beautiful scale of blue tones. I also wonder what kind of a mood he/she was in. A little bit temperamental I would say. In a good way though. 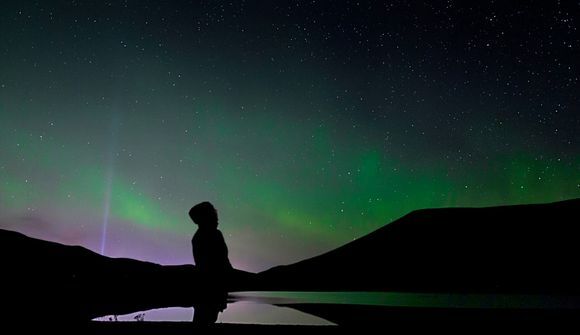 Mývatn area is pretty wild and it must be the adventure of a lifetime for geology enthusiasts to come here and view so many different types of geological phenomenon. Or to be completely ignorant in that field and be overly surprised by everything going on! 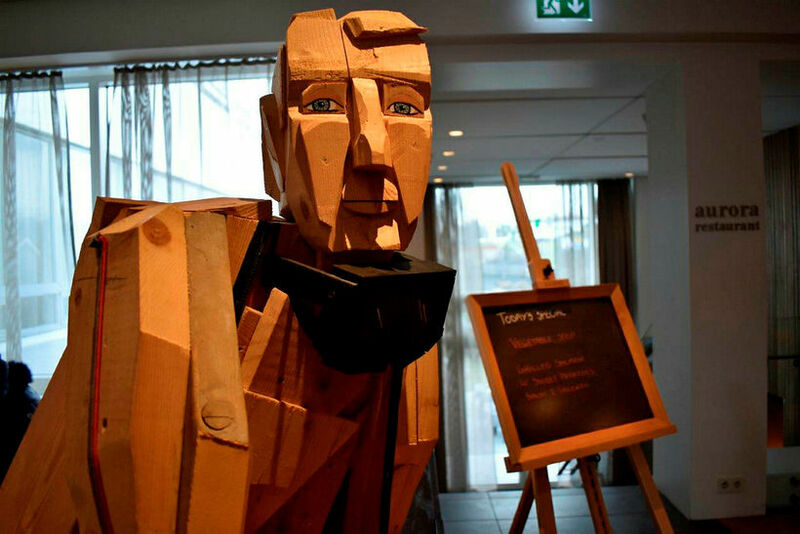 A nice fella' at the bar in the Icelandair Hotel Akureyri. Relaxing in Akureyri capital of the north before going back is just perfect; no more surprises, just cozy prettiness all over and loose ambiance. The hotel bar at the fancy Icelandair Hotel seems to be the gathering place of the town's inhabitants and the feeling is comfortable and homey. It's good to see people again, mingle with the locals. Eerie weather, cold, silence, down duvets. I had it all, so did Agnes. She was blue and bored and couldn't stand it. I, on the other hand, loved it. I also had sophisticated food, outstanding hotels, luxurious comfort, wonderful warm baths; an overall thrilling and fulfilling trip. Sorry Agnes, I wish times had not been so hard when you were here. I wish you hadn't have to suffer all this injustice. But your story is being told and will surely be told again. By the way, I say hi to Jennifer Lawrence.